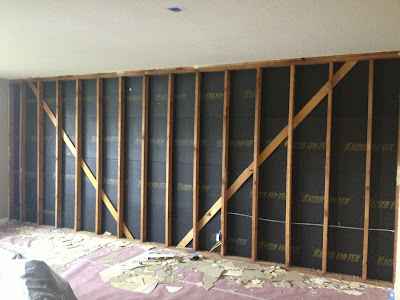 musings of a madwoman: Because why not start new home improvement projects when you're 7 months pregnant? Because why not start new home improvement projects when you're 7 months pregnant? So for starters, I passed my glucose test! Quite a relief. My husband and I have been talking for years about making various improvements to the house, and there are many reasons we haven't done so. 1) We are unskilled and lazy, so DIY projects are out. We've tried stuff in the past and it just never works out. 2) Hiring people to do stuff for you is expensive, and then there is a strange man showing up at your house at 7:30 a.m. and then he's making a lot of noise and sweating. 3) Sheer procrastination. We are really, really good at procrastinating. Now, the house needs an overhaul. New kitchen and bathrooms and everything. Months ago, when I first learned I was pregnant, would have been a good time to get the ball rolling on those kinds of projects. 'Twas not to be (See #3 above). So now we are down to what absolutely must be done before this child arrives to live in our house. 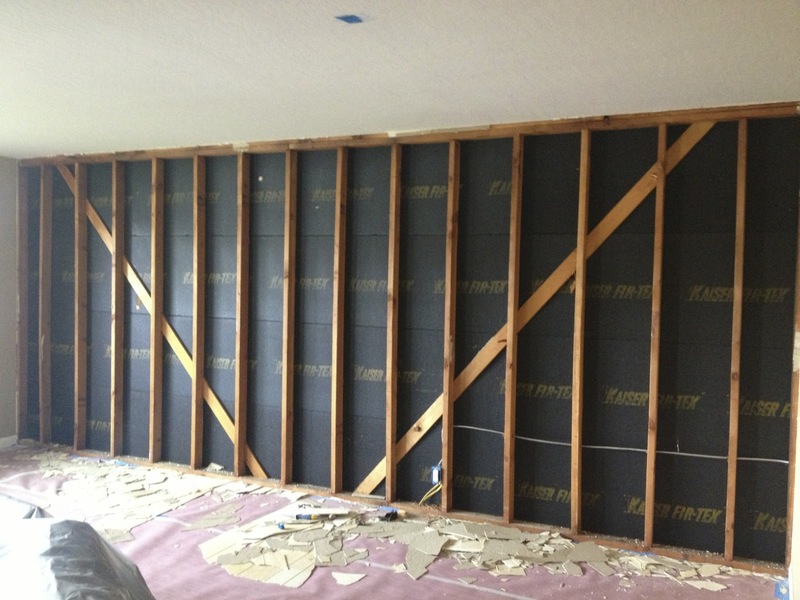 1) Demo two walls, insulate, drywall, sheetrock, and texture. So we discovered there are these two walls in the house that were really just wood paneling that had been textured over. Verrrry tricky, former homeowner. 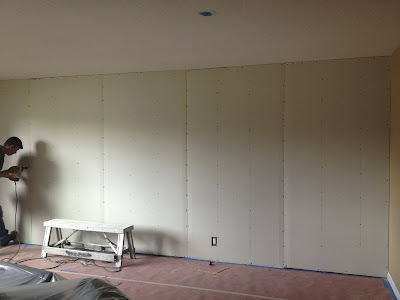 Eventually the paint and texturing started to bubble away from the paneling, and it was revealed that not only were a couple of walls wood paneled, but they didn't have a shred of insulation. 2) Paint. Specifically the rooms in which the new walls are going up -- the family and living rooms -- plus the hall and the baby's room. 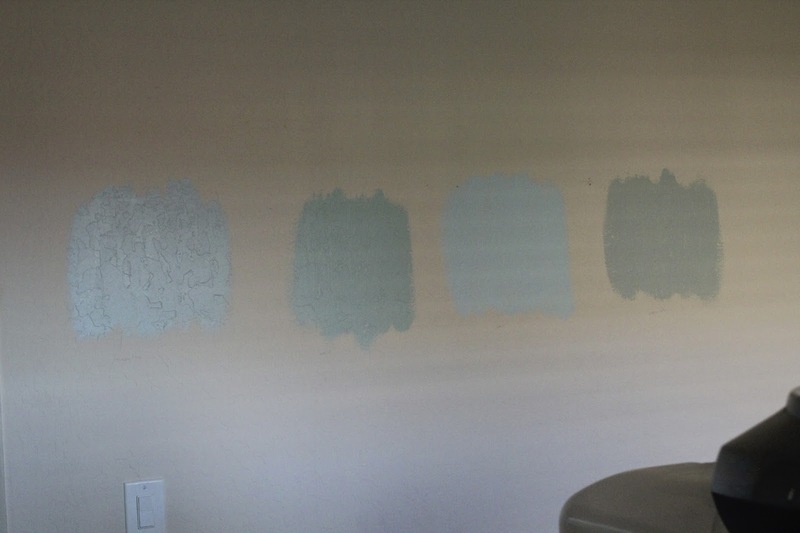 Paint options in the baby's room. I would have chosen yellow over blue but I've heard from a couple sources that babies hate yellow? It makes them angry or something? Whatever. Can't risk it. Paint options for the living room/family room/hall. These are all variations of gray, although they look bluish to me. I'm worried that once the paint goes up it will look blue and I will freak the eff out. 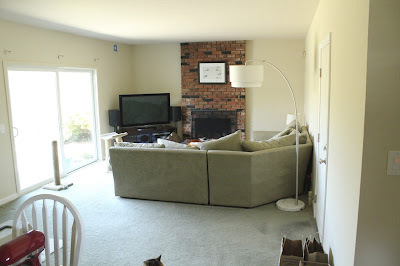 3) Can lights in the living room, kitchen, and family room. This place is kind of a cave. Let there be light!! 4) Ceiling fans in the master, office, and baby's room. I recently read that babies with ceiling fans in their room have a much lower incidence of SIDS, so I was like: Done and done. So here are a couple "before" pics. I've got a lot more and once everything is done I'll put up before and after photos. The infamous green wall. I've always sort of loved it but I am pretty sure I'm the only one. The contractor who came by to give us a bid looked a bit traumatized by it. Pardon the piles of baby paraphernalia. They don't have a home yet. The family room. The plan here is paint the walls gray and the fireplace white. Then install a mantle, replace the flooring, probably with a faux wood/laminate, install window coverings, can lights, art, yadda yadda. nothing like a baby to light a fire under you! we painted our living room gray and it turned out purple, in most light, and 4 years later, we are too lazy to change it. so be careful with the grays! This is my exact fear about the gray! Aaaack! Yeah I took those in the evening, so they look completely different. I is gud at fotos! 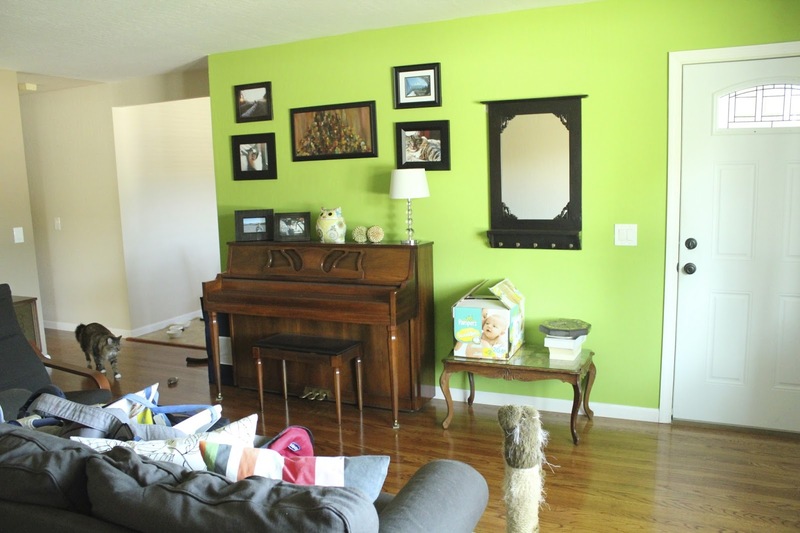 So, um, the baby room colors and the living room colors are ... not the same? lol ... I know. They look exactly the same in the pictures. I swear they're different! A friend of mine ended up moving when she was 8.5 months pregnant. Just the thought of it makes me cry a little bit. That said: Looking forward to the after photos! Especially the family room - love the gray walls white fireplace idea. We thought we wanted to move, too, and then we had an extremely rare moment of clarity and were like: Oh wait. We are having a baby. That is quite enough, thank you. Wow, you have, like, a real house. 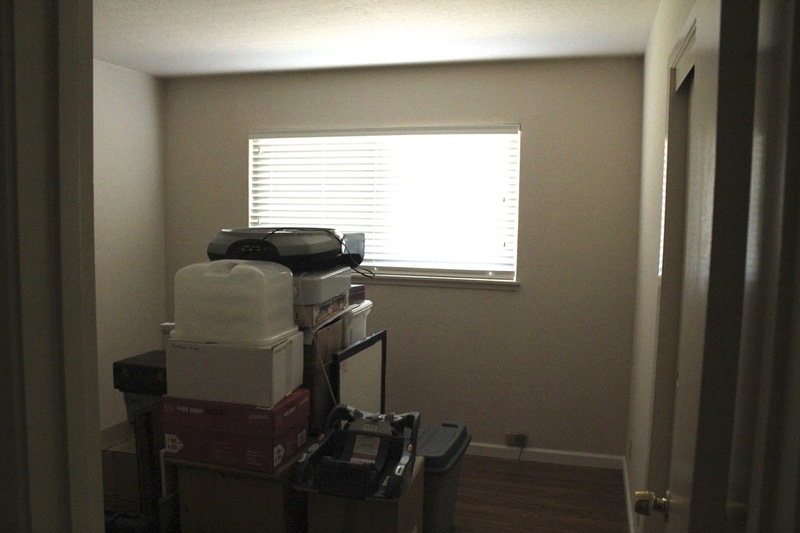 With multiple rooms and paint and things. So you actually did end up hiring someone to do all this? Because I feel overwhelmed and am currently jobless and not pregnant. 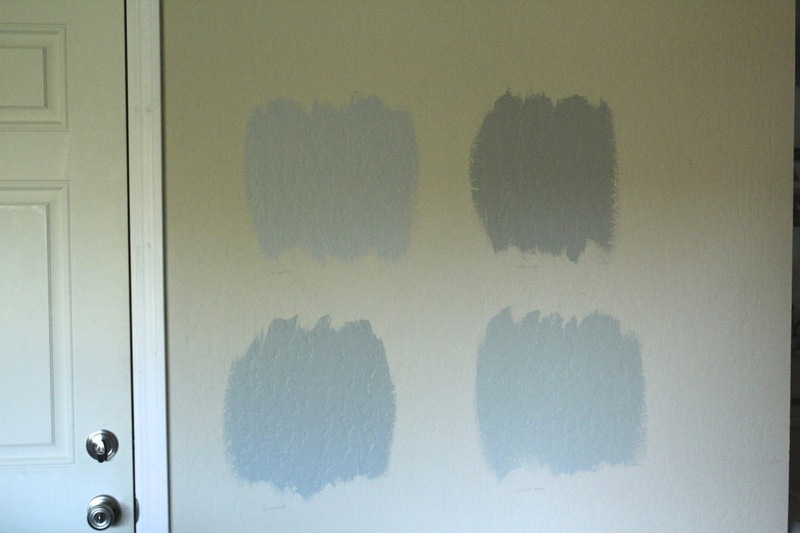 I like the paint on the right in the first picture and the top right in the second picture, because they are the same color.